Xenia Olivia: Airplay : blowouts, updos and makeup in Hong Kong! 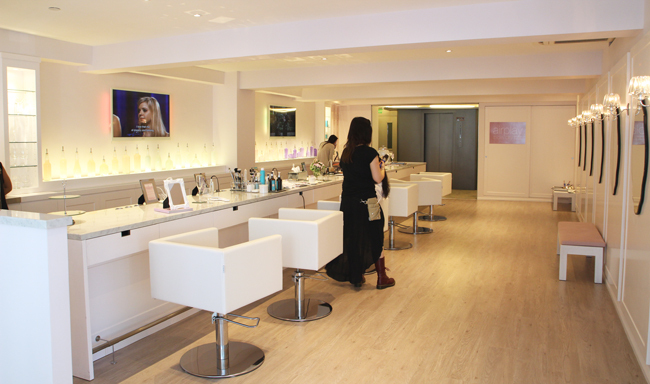 Airplay : blowouts, updos and makeup in Hong Kong! After being in Japan for 4 days and seeing the amazing hair girls have there, I decided it was time for me to get a nice hairstyle of my own. I mean, seriously, Japanese girls seem to have just been out from the hairdresser all the time! How is that even possible, huh? Secret, please? Anyway, I decided to go to the newly open Airplay blow dry bar, which landed in Hong Kong a month ago and it's already the new buzz in the city. 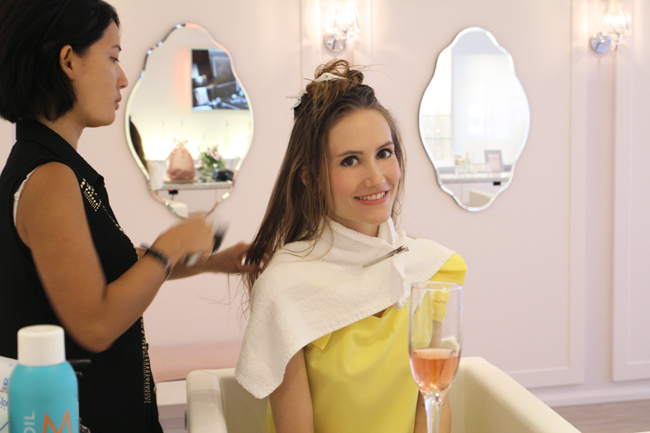 Blowouts and updos cost HK$280 and come with an aromatic shampoo bar, meaning they wash your hair before proceeding to the hair setting, and in no ordinary way! They have six shampoo shots for you to choose! Each of them has a different scent (cherry blossom, green tea, jasmin, blueberry, mandarine...), and a different function, too! My favorite scent was blueberry but I finally went for green tea because it had the function of giving extra volume to the hair, which is what I needed for the hairstyle I wanted! My hair is naturally super straight, and I chose their "Mojito" hairstyle, which is with lots of curls and volume, so the volumizing shampoo kinda was a must. You may be wondering why the hairstyle I chose is called Mojito instead of simply Curly with volume or something like that. 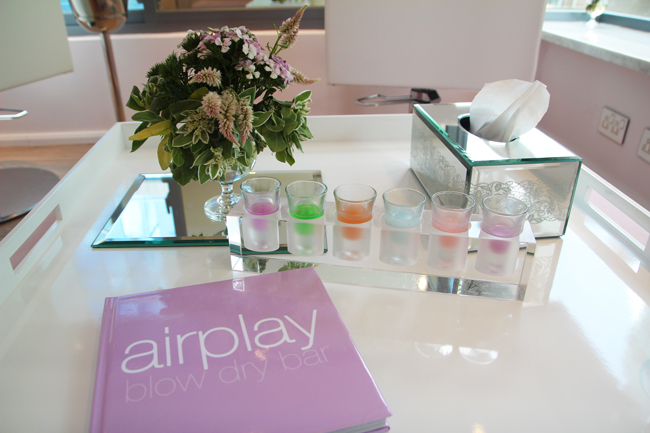 Well, Airplay blow dry bar plays with the idea of a "bar" so all their blowouts and updos have cocktail names! 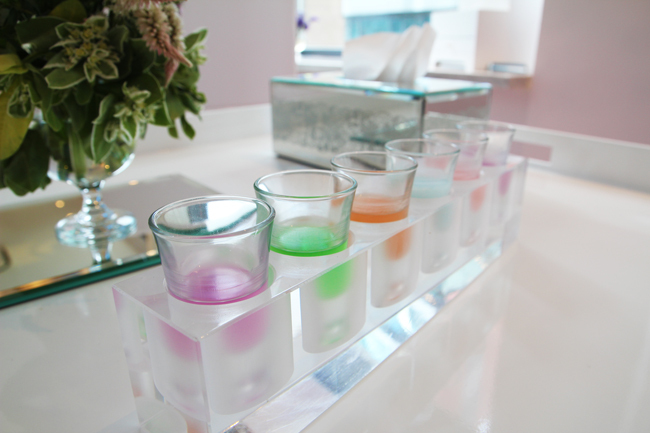 In fact, they also have Mocktails which is the same service but for girls under ten, and for just HK$150! I thought that was so witty! So I visited Airplay last week Thursday at 2pm and I was greeted by the charming manager Olympe, who showed me around and introduced the concept to me. She gave me the blowouts and updos menu, which comes with pictures so that you know what you're choosing, and the shampoo shots for me to smell and choose! I recommend you choose your hairstyle first, because you might need a special shampoo for it, like in my case, because I chose the curly Mojito I needed the green tea shampoo that could give more volume to my hair. 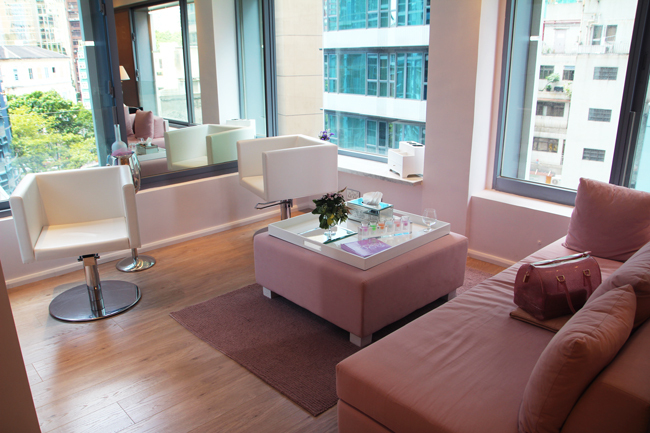 Everything at Airplay is done efficiently yet in a relaxing way. 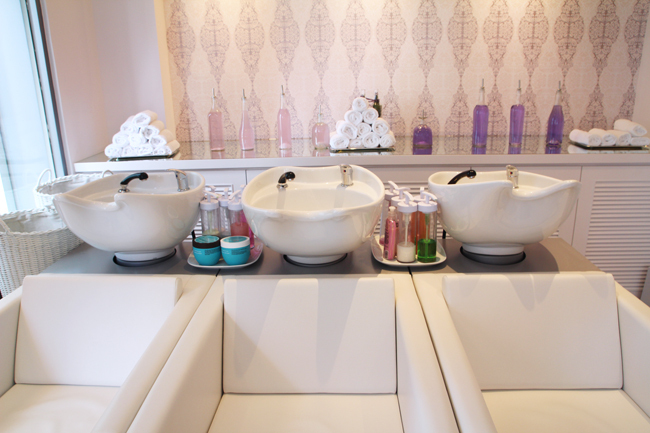 The hair washing comes with a three-minute head massage, which I looooved! 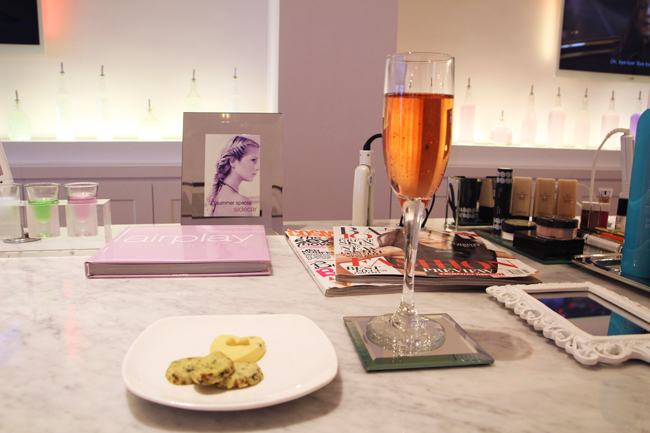 Then back to my seat I was offered sparkling rosé, green tea cookies and a French heart-shapped biscuit. You can choose tea or water instead of the rosé if, say, you go to Airplay early in the morning and you're still not up for it! This was the first time for me to be at a hair salon where there's no mirror in front of me but behind me! In fact in front of me there were two huge TVs streaming Project Runway and a movie of Sarah Jessica Parker. There were a bunch of magazines, too, of course. TVs on the left, mirrors on the right! I was wearing blouse and necklace from my shop Frill Me. Love your hair, you're gorg! and you look great in yellow!!! Style Glam salon offers Best quality service for men and women in entire Fresh meadow and Jamaica Estates in a pleasant environment by highly trained professionals on a daily basis including Hair Cuts, Color highlights, Make up, waxing, manicures & pedicures, massages, facials, electrolysis and more. Nail salon in fresh meadows ny. Latest Fashion updates I have been searching to find a comfort or effective procedure to complete this process and I think this is the most suitable way to do it effectively. Dsquared Super site! I am Loving it!! Will return once more, Im taking your food likewise, Thanks. braccialetti con scritte personalizzate Hi! This is my first visit to your blog! We are a team of volunteers and new initiatives in the same niche. Blog gave us useful information to work. You have done an amazing job! stock market live They're produced by the very best degree developers who will be distinguished for your polo dress creating. You'll find polo Ron Lauren inside exclusive array which include particular classes for men, women.